Although it is over ten years since we moved back to the UK, after two houses and several years in France, whenever I spot a French car, I still have to look for the départment number on the plaque. And if it’s 46, I give a little inward cheer and find myself smiling stupidly, or even waving at the startled occupants. Le Quarante-six: the Lot is in the region now known as Occitanie. Aptly named, it has it all. It is the department where the transition from the cooler, wetter north to the dry, hot south is encapsulated. The honey-coloured walls, steep roofs and small, flat tiles of the houses and pigonniers of the north part of the Lot, bordering the Dordogne, give way to the dazzling white stone and curved Roman tiles of the south, around Cahors. From the majestic rivers lined with vineyards to the ancient villages and bastide towns, the stunning châteaux and the fields of sunflowers, the low-key agriculture and characteristic architecture complement the distinctive natural beauty of the region. Walk along any country road in the spring and early summer and count the number of different orchids growing in the verges. The fields are full of splashes of deep blue muscari, carpets of violets and, later, the distinctive magenta of the wild gladioli. As summer progresses, sky-blue chicory and red poppies carpet the limestone reaches of the Causses, in the deep south of the Lot. Wander along the Chemin St Jacques as it crosses the Lot from Figeac to Cahors and on to Moissac and you’ll see big, bright green, lizards and small, dark brown, ones scooting out of your way, and maybe even the exotic hoopoe. 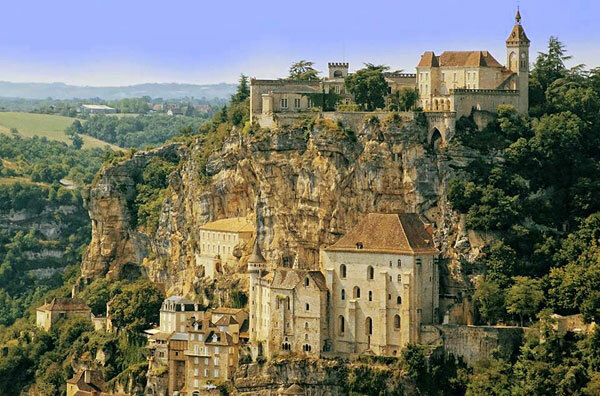 Take the northern route and you’ll pass through the astonishing village of Rocamadour, clinging perilously to the cliff face above the river. Pilgrims have passed this way for hundreds of years, an important stop on the way to Santiago de Compostela. And below ground the wonders continue. The rivers that cross the region have carved canyons and cliffs in the soft limestone of the Causses and have given rise to the many caves and caverns where pre-historic paintings bear witness to the sophistication of our ancestors. Our first house was in the north of the Lot, not far from the pretty town of Gourdon. We had red squirrels and beautiful, lichen-covered trees everywhere, a testament to the clean air. Then we moved south, to the edge of the Lot, near to the village of Montcuq, with its distinctive hilltop tower, all that remains of the medieval castle that was once a stronghold of the Cathars. Here the honeysuckle was a hazy mass of busy hummingbird hawkmoths and lime-green mantids stalked the swimming pool. When I started to write, I knew where my inspiration would come from. Buzzing towns like Cahors, sleepy villages, fairy tale châteaux, the stunning countryside, the vibrant street markets. And the people. The café owner, the estate agent, the baker, the doctor, the expats. They’re all part of life in France and, for me, the Lot is France. So Douglas Adams got it wrong in the ‘Hitchhiker’s Guide to the Galaxy’. The answer to the Ultimate Question of Life, the Universe, and Everything is not 42. It’s 46.